In order to show an impressive and decisive front “against the Right”, a concert was organized for Monday, 3 September. The hashtag #wirsindmehr (“we are more”) was used, to suggest that non-Rightists were the majority. 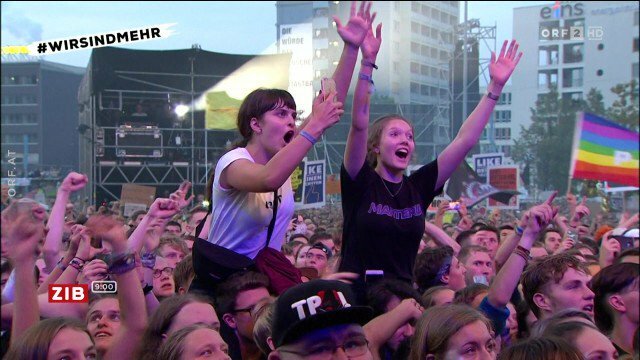 And indeed, up to 65,000 young people came to attend the concert which featured such well known German bands as Die Toten Hosen, Kraftklub and Feine Sahne Fischfilet. Additional motivation for attendance was provided by the fact that the concert was free. It was also supported by the online carshare firm BlaBlaCar which offered petrol vouchers for 20 euros for everybody who registered a trip to Chemnitz on this day and who took at least one additional person with him in the car. The bus company Flixbus promised to use double decker buses instead of single decker ones, to facilitate the transport of people to the concert. In addition, one of the co-founders of Flixbus offered free bus tickets. Not to be left behind in support of a worthy cause, Coca-Cola offered free drinks at the concert. The concert was enthusiastically celebrated by most of the the media (for example here and here) and by many politicians. Even the German Federal President Frank-Walter Steinmeier (SPD) expressed support for the #wirsindmehr concert by sharing the invitation for it on Facebook. [The President wants] to encourage people who want to stand up for the togetherness after the disturbing events of Chemnitz and want to take a clear position against xenophobia and violence. In this sense, he supports the concern of the initiative #wirsindmehr. Unfortunately, it turns out that the song texts of some of the bands playing at this concert in protest against “rightist violence” were extremely violent. Others were known in the past for violent, extreme-left song texts and for other far-left activities. In the video below, the K.I.Z. performance starts at 0:20 and the band sings the above text excerpt at 0:44. The band K.I.Z. at the #wirsindmehr concert in Chemnitz. Exactly the right band for a concert which has been organized against hatred and violence. And the stupid crowd cheers them. Another band at the concert, Feine Sahne Fischfilet, has been under observation by the Federal Office for the Protection of the Constitution, Germany’s domestic security agency (the “Verfassungsschutz”) , for left-wing extremist activities (though apparently not since 2016). The band Feine Sahne Fischfilet at the #wirsindmer concert. The autonomous punk band FSF [Feine Sahne Fischfilet] pursues not only musical but also left-wing extremist activities – it can therefore be regarded as a political group. [Being observed by the “Verfassungsschutz” was] due in the first place to their open hatred for the police. “We put together our own squad and then send the mob up on you,” it says in a song. And further: “The helmets of the cops, they should fly. You get your truncheon into your face, and then we send you to Bavaria, because the Baltic Sea should be free of cops”. Maas was the Minister of Justice of Germany at the time of the above Tweet. It seems that some of the media started to wake up and realize how grotesque it was that the celebrated “fight against the Right” was carried forward by bands like Feine Sahne Fischfilet, and criticism started—for example here and here—against the German President’s support for the concert. Criticism of the President came also from the German Police Union and even from the CDU, the party of Chancellor Angela Merkel. On this day it became known that the “Verfassungsschutz” in the German Federal State of Bremen was keeping the AfD youth organization under observation. The Social Democratic Party (SPD) now wanted to apply this for the whole country. The reason: the “grieving march” of the AfD on the previous Saturday. It was an almost perfectly peaceful march but because the AfD marched together with Pegida—an organization which is invariably labeled as xenophobic and anti-Islam—it was guilty by association. There were also vague statements trying to blame the AfD, at least partially, for the “riots” or the “far-right mobs” the previous week. 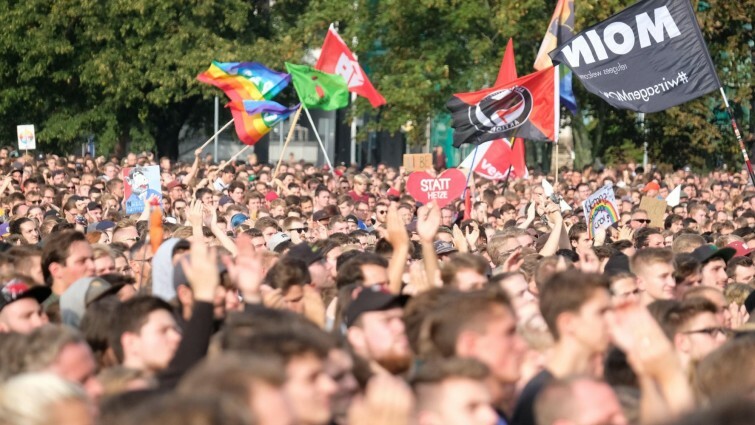 The organizers of the concert on this Monday evening claim in their invitation that in Chemnitz “thousands of people” had moved through the city and hunted other people because of their origin or their skin color. This is demonstrably wrong. There was, according to all that one knows, only isolated attacks, but no large-scale manhunt (the NZZ has reported about this at first incorrectly, too). More of such voices were to appear in the coming days.